Following last week’s DLC details blowout for the two versions of Hyrule Warriors, we now have one additional piece of info concerning the game’s summer plans. It looks like the console and portable versions of Hyrule Warriors are getting a DLC character from the beloved Link’s Awakening. Her name is Marin and, to fans of the SNES classic, Link’s Awakening, you’ll probably recognize her as the musical young girl who saved Link’s life when he was shipwrecked on the island of Koholint. Since Marin looks a heck of a lot like Zelda, Link at first mistakes her for the beloved princess. 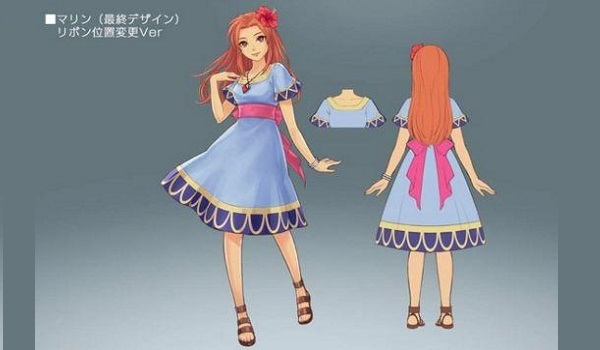 She plays an important role in the game, so it’s nice to know Marin will be making her way into Hyrule Warriors. If we had to make a guess, we’d say she’ll likely use her handheld harp as a musical weapon of sorts. If it seems like Hyrule Warriors is getting a lot of ink at the moment, it’s because Nintendo keeps dishing fresh details. The Wii U version of the game launched about two years ago, though the 3DS version didn’t arrive until this past Friday. To celebrate the occasion, Nintendo last week pulled back the curtain on DLC plans for both the console and portable versions of the game. While the Wii U’s plans were a bit more vague, we got lots of info concerning the new maps, adventures and characters coming to the 3DS version of Warriors. Over the weekend, however, Nintendo let slip even more Hyrule Warriors details in a panel for the game at WonderCon. Gamespot reported from the show floor, revealing Marin’s summer launch on the Hyrule-infused musou game from the creators of the Dynasty Warriors and Samurai Warriors series. They’re also behind the Warriors Orochi games so, as you can see, they like having the word “warriors” in their titles. So now that we know that Marin will be included in the Link’s Awakening Pack, we still have an undisclosed new map and weapon for Linkle to look forward to. And if you’re playing on the 3DS, you’ll also be able to get your hand on 15-plus new costume pieces for your Fairy friend. Unfortunately, other than the fact that Marin will be in the game and, based on the above image, look like she did in Link’s Awakening, we have no other details to go on as to how she will play. We’d be interested to hear your theories in the comments section below. Also, any other fan-favorite characters you’d like to see announced for future updates?